June 2006 – My Story – ISB and beyond !!! Hope I didn’t miss any songs in the above listing. Lakshmi played the violin really well with beautiful raga alapanas of bilahari and pUrvi kalyAni. I think she has a really bright future in this field. 1) Boycott was facing a torrid over from Micheal Holding . After playing his first 5 deliveries somehow, he got out bowled the last ball. When Boycott entered the dressing room, one of his teammates remarked something about the supposedly best test opener of his times. Pat came Boycott’s reply: “If it wasn’t for Boycott, England would have been 0/6 by the end of that over”. 2) “Man, it don’t matter where you come in to bat, the score is still zero.” -Viv Richards to Sunil Gavaskar at Madras 1983. 4) Fred Trueman bowling. The batsman edges and the ball goes to first slip, and right between Raman Subba Row’s legs. Fred doesn’t say a word. At the end of the over, Row ambles past Trueman and apologises sheepishly – “I should’ve kept my legs together, Fred”. 5) Then there’s this wicketkeeper who quietly asked the new batsman: “So how’s your wife, and my kids ? ?” Guess who………Rod Marsh….to Ian Botham!! Incidentally, Compton was no better. John Warr said, of Compton “He was the only person who would call you for a run and wish you luck at the same time.” Anyway, when Wells played for Gloucs, he had an equally horrendous runner as the No.10. During a county match, horror of horrors…….both got injured. Both opted for runners when it was their turn to bat. Bomber played a ball on the off, called for a run, forgot he had a runner and ran himself. Ditto at the other end. In the melee, someone decided that a second run was on. Now we had all four running. Due to the confusion and constant shouts of “YES” “NO”, eventually, all of them ran to the same end. Note: At this point in time, the entire ground is rolling on the floor laughing their behinds out. One of the fielders – brave lad – stops laughing for a minute, picks the ball and throws down the wicket at the other end. 1) sAmininnE nEla (varnam) – kannada – Adi – ? 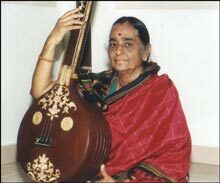 “Sangeetha Kalanidhi” Smt R. Vedavalli (refered to as RV henceforth) is considered to be a living legend. In a career in Carnatic Classical music spanning over five decades, she has enthralled audiences in India and abroad with her staunch adherence to tradition, deep understanding of and vast knowledge about Carnatic music and manodharma (improvisations). Though in her 70s, she continues to give quality concerts even today. Though I had been hearing RV recordings for quite some time, I had never got the chance to attend her live concert. I came to know about a month back that BTM Cultural Academy is organizing her concert in Bangalore and had been eagerly waiting to attend the same since then. Having attended the same today, all I can say is that it was truly a great experience. During my childhood days, whenever I heard old maestros sing, I used to wonder why people liked them so much. The quality of recordings would be poor and All India Radio would add to the woes through its poor broadcasts. A beginner in Carnatic music at that time with no one to teach me the nuances, I would get pissed off upon hearing such recordings. As I started hearing Carnatic vocal more, I learnt more and more by myself and started appreciating the nuances. I then started hearing recordings of old maestros and then realized why they are revered by many even today. For example, we had this old audio cassette of Shri T. N. Seshagopalan (TNS) at home. It was one of the very few audio cassettes we had at that time. The quality of the cassette was not all that good and I could never understand why my father used to praise TNS so much. I happened to hear the cassette again when I was in Class X. Though having heard quite a few musicians till then, I had never heard anything like what TNS had sung in that cassette before. I instantly became a fan of his and he continues to be one of my all-time favorites even today. Coming back to RV …… will write more about her concert in the next post. I can’t hold myself down. My FIRST day on the job!! And I like it already. “Assistant Junior Deputy to the Vice Chairman – Manufacturing”. My dad was thrilled when he heard my designation. Need to meet HR in half an hour. I can’t wait to get my first Employee ID Card and cubicle. I hope Parthasarathy Whatayblouse Crappers (PWC) is the beginning of great things. P.S. I have brought my favorite textbooks back from the institute OD, OMand HR should help me grow rapidly in the organization. And I WILL handle soft issues before facing hard issues here at PWC. Had a lot of fun with HR yesterday. The guy who had recruited me had left a month ago. So they didn’t know I was joining. We had a hearty laugh over that one. I’ll get my cubicle in a few days time. For the time being I am sharing a nice one with Claire. She’s with Corporate Communication. Met my boss today. He spent a lot of time with my CV and then asked me how I managed to get a job with them. (Even he knows how lucky they are to get me..) He told me to review our material ordering system in the err… umm… the… the “big yellow and blue noisy machine section” of the plant. Claire is working on an “Our Employees Love Us” campaign. The office boy had just resigned. So she got me to pose with an apron and a tray of cookies for a photo. They are going to call me Ramon and use it for ads. I am going to be famous. Claire resigned today. She told me carry on with the “Our Employees Love Us” campaign. I sent my first official letter today. It was to our Facilities manager Merry Le Bian. She is a hottie. I told her that the Coffee Machine takes too much time to reheat between refills. Wrote it in a WAC format and all with a table of contents and everything. She is sure going to be impressed!! I spell checked it in MS word and emailed it to her an hour ago. No reply yet. too much space left in my cupboard. My letter came back. It had a pink post-it on it from Merry. “Please proofread” it said. It was CC’d to my boss. How was I supposed to know MS Word would spell check her name and change it to Merry Lesbian????!!!! Today five minutes before a meeting the cupboard door broke open. It took me ten minutes to pick up all the ball bearings from the floor. I had to run to the board room for the meeting and slipped on a bearing which rolled under the door. I fell on the coffee machine and tipped coffee powder into the polymer mixing matching tray. No one saw anything. P.S. Sorry for the long break. My computer crashed. There was a mail from an old friend. She’s now married into the Welchia family I think. Ford Prefect‘s was the hilarious blog I used to visit a lot till some time back. I do read his blog even now but there is one more that I have been frequenting these days – Great Bong’s blog @ http://greatbong.net . I have been hooked to this blog ever since I received a link to a post on the great Mithun da sent by my ISB batchmate Giks. Read the blog to know why. Rudest city in the world? A survey done by the magazine Readers Digest has resulted in amchi Mumbai being termed as the rudest city in the world, when it comes to common courtesy. Sao Paulo and New York have been found to lie at the other end of the spectrum. Click here to read more. Are common courtesies so common in India? Some of them aren’t and at least don’t seem to be a part of the culture, in general. For example, during the time spent at my previous company and at ISB, I have met or come face to face with a lot of non-Indians. I have observed, for example, that most of the times you pass by an American, he/she will smile and wish you even if he/she is seeing you for the first time. Same thing is true when holding the door for people coming behind you. In general, I have only seen fellow Indians who have been to the US for some time doing the same. Holding the door for others was however a common practice in my previous company. Whenever new recruits came, they would generally not do the same but would start doing so once they saw others in the company doing it. If common courtesy demands a few things which most of us lack, how do we make the change happen? Expecting a person to change on his/her own is a bit difficult, especially because of lack of realization that such courtesies should be extended. A better way probably would be for companies to make their employees aware of these. If more and more people start becoming more courteous through this route or otherwise, others around them might observe and change themselves too.